Over the course of February and March, advocacy organizations of all stripes host “fly-in” days, where advocates from around the country come to Capitol Hill to make the case for federal funding priorities. These events are concentrated in February and March to align with the beginning of the congressional appropriations cycle. After the president submits a budget request in February, Congress begins its own budgeting and appropriations process: Members of Congress submit individual requests and sign on to collective letters that make the case for particular priorities. These letters and requests are then sent to the chairs of the Appropriations Committees, who take them under advisement when drafting their bills. On Humanities Advocacy Day, advocates from around the country will meet with the offices of their representatives and senators to advocate for federal humanities funding. These Capitol Hill meetings are the linchpin of our broader advocacy strategy: they allow constituents from around the country to offer first-hand accounts of the value of federal funding for the humanities and ask their legislators to sign on to letters requesting robust funding for the National Endowment for the Humanities, Title VI, Fulbright-Hays, and other humanities programs. These meetings have been successful in convincing both Republicans and Democrats to sign on in support of humanities funding, thereby making our priorities bipartisan causes. Our advocates generally find that staffers are pleased to learn more about the humanities in their states and districts, and that the experience demystifies Hill-based advocacy. Last year, we saw a sharp increase in registration for Humanities Advocacy Day spurred by the collective alarm about the new administration’s proposal to eliminate funding for nearly all federal humanities programs. In addition, NHA launched a targeted recruitment campaign to ensure that humanities advocates who had representatives or senators on the Appropriations Committees joined the effort. University presidents and provosts in key districts and states rallied to the cause and sent faculty members to Washington. Scholarly societies played a key role in this effort, supporting travel and lodging for advocates from others of our target states. In the end, advocates from 45 states joined the effort and we scheduled nearly 300 Hill meetings. These Capitol Hill meetings were complemented by more than 250,000 messages to Congress and the administration, and scores of op-eds in support of funding for the NEH in media outlets around the country. After this advocacy push, both the House and Senate rejected the administration’s proposals. While the appropriations process is not yet complete—and we have seen continuing resolution after continuing resolution—both the House and Senate Appropriations Committees have proposed strong funding levels for the NEH, and there is a strong possibility that the NEH will receive level funding for FY 2018. This year, we expect the president’s budget request to once again propose the elimination of or significant cuts to the NEH and other funding priorities when it is released later this month. To ensure that Congress once again opposes these proposals, we need to continue to cultivate the support we built last year. 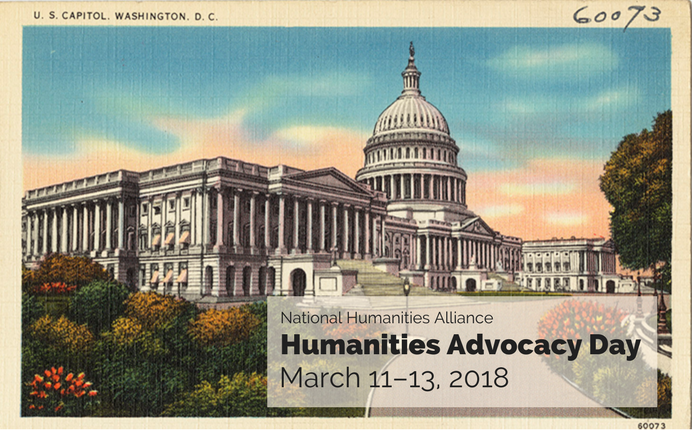 The 2018 Humanities Advocacy Day scheduled for March 11–13 is the first step in building sustained relationships with congressional offices that will allow us to counter the administration’s proposals. After their meetings, advocates will have a direct line to a staffer in several congressional offices with whom they can follow up at crucial junctures in the appropriations process. We look forward to welcoming advocates from every state in March so that we can ensure that we block a renewed effort to eliminate humanities funding. In order to meet this goal, we still need advocates from Hawaii, Louisiana, Minnesota, New Mexico, Oregon, Rhode Island, South Dakota, Texas, Vermont, and Wyoming. If you live in one of these states, please consider joining us. If you have colleagues in these states, please encourage them to join us. If you do not live in one of these states, we can still use your help. The more voices in support of humanities funding, the better. To learn more about how to participate in Humanities Advocacy Day, visit nhalliance.org. Together, we can build on the gains we made last year and block a new proposal to eliminate funding. Image: Postcard, US Capitol, Washington, DC. Published by the Washington News Company, c. 1930–1945. From the Tichnor Brothers Collection of the Boston Public Library Print Collection via Flickr.